Following the triumph of the right in Spain’s 1933 elections, some artists who supported the reforms previously implemented by the Republican leaders adopted an artistic language along the lines of Critical Realism. Taken even further, as a result of the outbreak of the Civil War, this language became radicalised with the aim of defending the legitimacy of the Republican government. This was the context for the participation of the artists that made up the Spanish delegation to the 1937 Paris International Exhibition. The Spanish Pavilion featured a range of different artistic trends, with Realism clearly dominating. This was sometimes unfortunate due to an excess of propagandistic elements, which ran the risk of taking priority over exclusively artistic values. However, this is not the case with Madrid 1937 (Aviones negros) (Madrid 1937 [Black Aeroplanes]) by Horacio Ferrer. The painting’s inclusion in the Pavilion was a resounding success with viewers. Ferrer had studied in Italy on a grant from the Junta de Ampliación de Estudios (Board of Advanced Studies). He spent one year there, between 1934 and 1935, studying, among other things, the fresco technique. It is also worth noting Ferrer’s early preferences and artistic knowledge; his library contained copies of French and German magazines involved in disseminating the fashionable trend in Europe from the 1920s onwards, the “return to order”. This idea was primarily advocated by two movements: the German New Objectivity and the Italian Valori Plastici. All of this was conducive to creations such as Madrid 1937 (Aviones negros), in which the obvious propagandistic intent of emphasising the distressing situation in wartime Spain is not diminished by the excellence of the pictorial outcome. The dramatic scene, which calls to mind the effects of the fresco technique, also emulates the content of Picasso’s own Guernica. 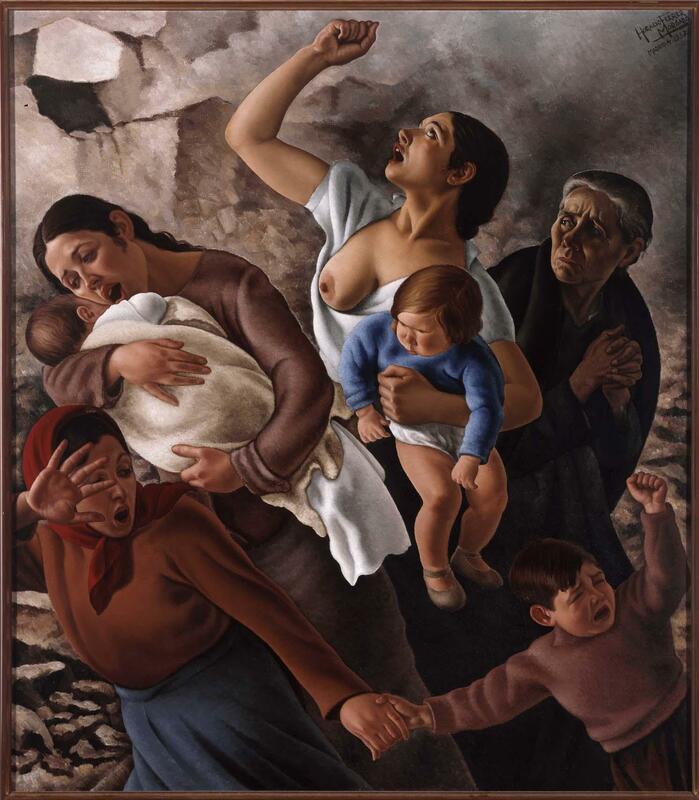 Indeed, although presented from a different stylistic perspective, here too the women flee in terror, their children in their arms, crying out against the bombings that have ruined their lives and displaying their utter scorn for the barbarity of war.